Central Tool Specialties manufactures flat braided flexible connectors to customer specifications and drawings for applications including expansion joints and connections for electrical and bus duct equipment. The current capacity of our flexible connectors can vary due to variation and customization of braids flexibility, plating, and the milled holes. The plating available for the ferrules and braided material vary from one another. The ferrules can be plated in tin (T), nickel (N), silver (S) and bare (B), while the braided material can come in tin (T) or bare (B). 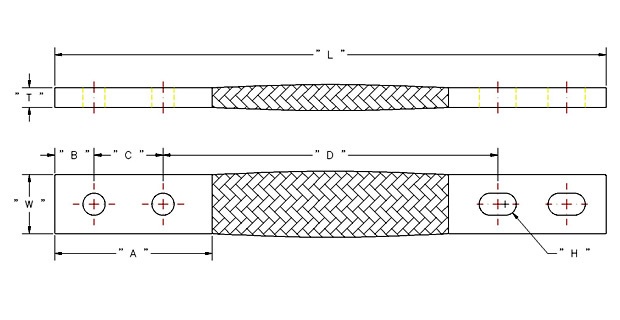 The milling of a braids hole can be drilled as desired in circles, squares, or slots upon the request of the purchaser. Numerous uses for flat braided flexible connectors exist within the power distribution industry, such as for damping vibration from generators and transformers, aligning equipment, and reducing energy loss. CTS-A 12-48" 1 230 100 36 1.5" 0.16"
CTS-B 12-48" 2 800 400 30 1.5" 0.38"
CTS-C 12-48" 2 850 600 30 1.5" 0.50"
CTS-D 12-48" 5 2000 1000 30 1.5" 0.88"
CTS-E 24-48" 4 1160 600 30 2" 0.40"
CTS-F 24-48" 2 rows of 7 3220 1400 30 3" 0.63"
CTS-G 24-48" 3 rows of 1 1200 600 30 4" 0.28"